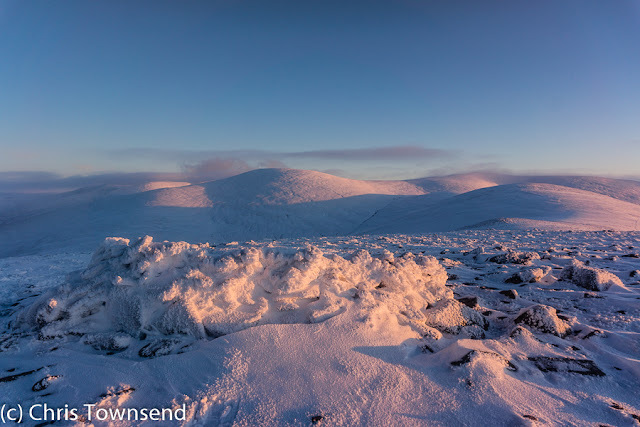 As the storms moved south and the weather in the Highlands calmed down I went up into the hills to see what the last blast of winter weather had brought. 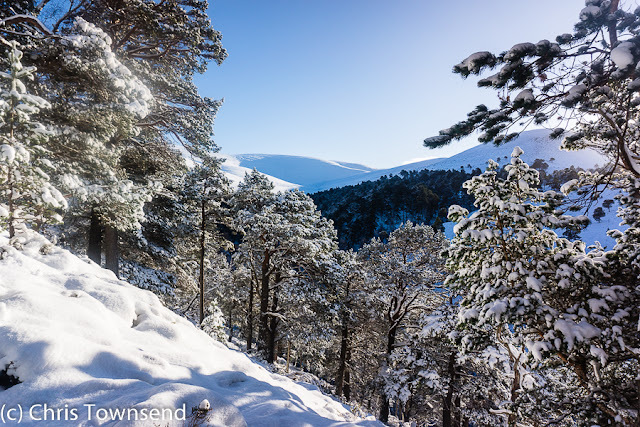 The roads were icy and the drive to Glen Feshie slow but there was compensation in the winter landscape, especially the trees heavy with snow. From the upper glen I climbed the path towards Coire Ruadh, snowshoes on from the car. The air was cold - the car thermometer said -8C - but still and as the snow deepened and progress became more strenuous I discarded hat, gloves and finally jacket. Above the sky was a deep alpine blue and the sun shone, though no heat could be felt. Not wanting to stay in the shaded glen when there was sunshine high above I changed my original plan of heading up the corrie and then returning over the tops. I wanted to be up there now. This last minute change led to a slower and more difficult ascent though and I didn't get as far as I'd hoped. Not that this mattered on such a glorious day. Just being here was enough. As I neared the top of the pine forest a pair of grouse flew low and fast through the trees soon followed by two more. They made no sound. Black grouse maybe. Red grouse are usually noisy. 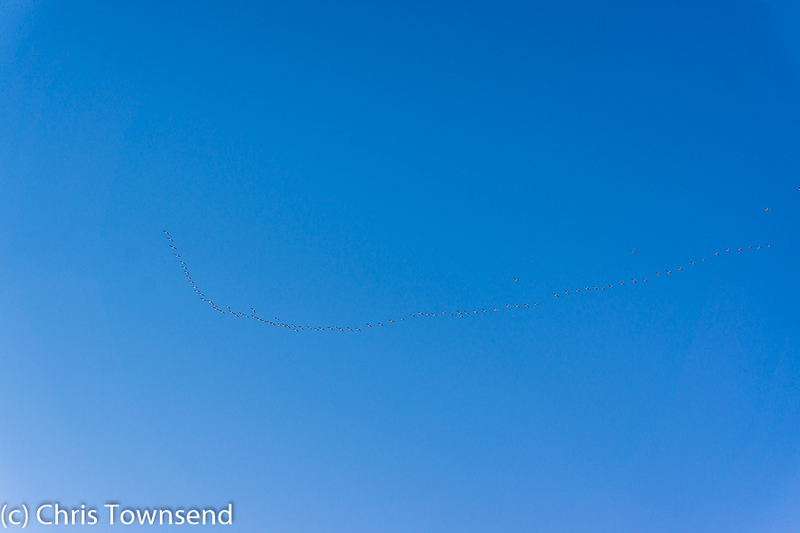 Soon I could see where they'd been walking through the snow and the wing marks in the snow where they'd taken flight. There were mountain hare tracks too and I saw two of these, barely visible when stationary so good is their camouflage. My snowshoes were making rather larger impressions than hare or grouse in the soft white landscape and I felt clumsy and ponderous as I watched a hare dart across the snow. High above faint wild cries broke the silence. As they grew louder I gazed upwards. 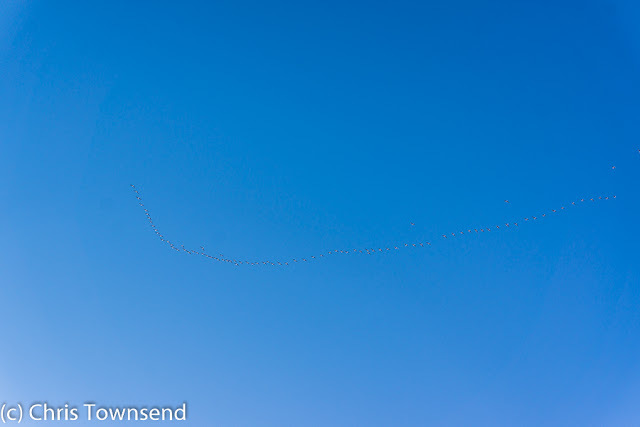 A skein of geese, black and white against the deep blue sky. 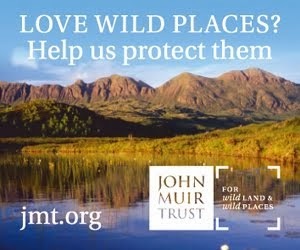 Their sound that of nature and wildness and beauty. From a high col I turned south-east towards Geal Charn, now regarded as a subsidiary Top of Sgor Gaoith though it was listed as a separate mountain in the original Munro's Tables. This was my poor route choice. The recent storm had come from the north-west, the strong winds dumping snow on southern and eastern slopes. On northern and western slopes the snow was much thinner and here on Geal Charn's stony steep north-west face that meant many rocks poking through the snow with thick heather between them. Every hollow and dip was evened out by the snow filling them in. 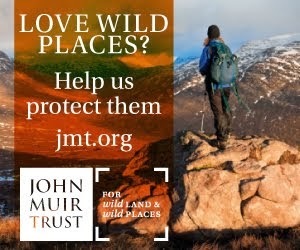 Sometimes I was scraping my snowshoes on rocks, sometimes sinking through unconsolidated powder into the heather below. Looking at my phone later it gave my average speed as 1.1mph. I could believe it. On the ascent it was nowhere near that. The arduous climb was worthwhile though. 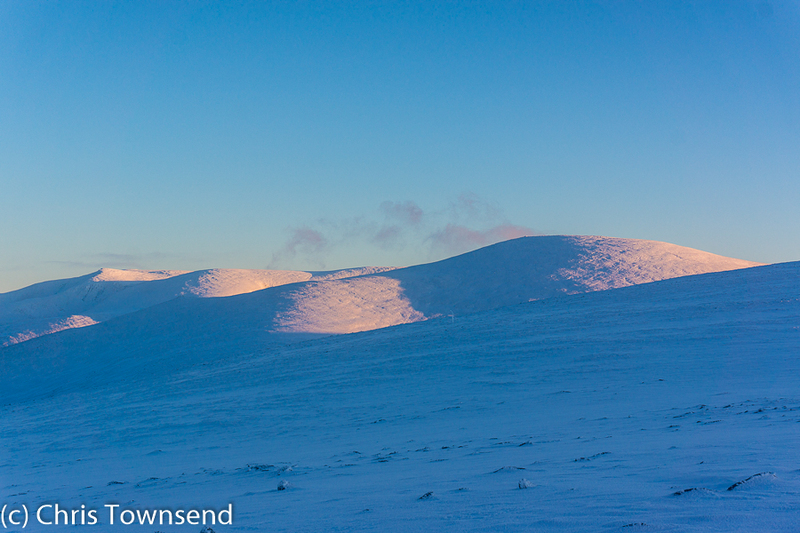 I reached the summit as the low sun lit up the bigger hills to the east, the snows glowing pink. Up here a faint breeze, barely noticeable, crept across the snow. With a temperature of -8C it was enough to chill me and hat and gloves were soon back on along with a down jacket as I replenished my energy with flapjack, chocolate and hot ginger cordial. With only a few hours of daylight left I decided this summit was enough. The glorious day required no more. I would go down. 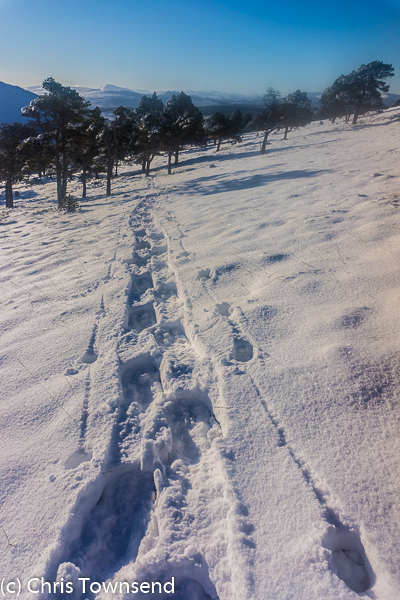 A mix of tracks - boots, skis, crampons - led away from the summit and down into Coire Ruadh. I followed these and found deeper more consistent snow that I could plunge straight down on my snowshoes, ramming their tails down hard. I should have come up this way. 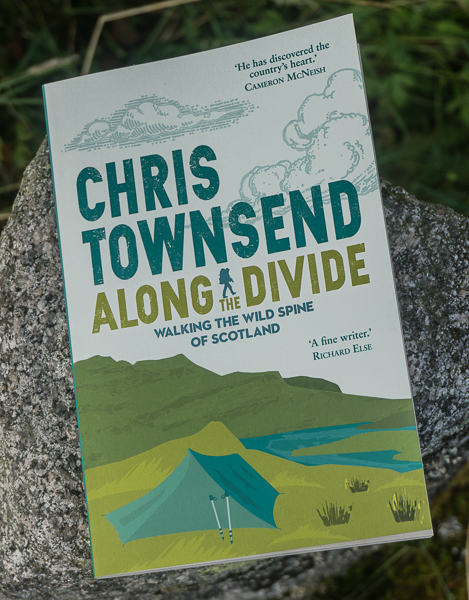 The sun sank in the west and a distant line of peaks were silhouetted against a red sky. The corrie and the woods below were shadowed now, cold and hard. As the last light faded I reached the first trees and finished the day walking by headlamp in their dark shadows. We had an unusually sustained fall of snow (by the standards of the west midlands) this weekend - 8" and more in places. It prompted me to retrieve an old friend from the depths of the wardrobe - my Sprayway Commanche. It's no longer in pristine condition but it's still a good jacket and I always have faith in it.